Reshawn Turner went 4-1 at 152 pounds. Jacob Grab tries to control his opponent during the Delmar Wrestling Invitational. Last weekend, Indian River High School’s wrestling team competed in the Delmar Wrestling Invitational, coming third out of 11 teams. Sussex Tech won the overall team honors, with 260 points. Woodbridge came in second, with a single-point edge over IR, at 239.5 to 238.5. Individually, three IR wrestlers topped their weight classes. Junior Christopher Saylor won the 106-pound class. 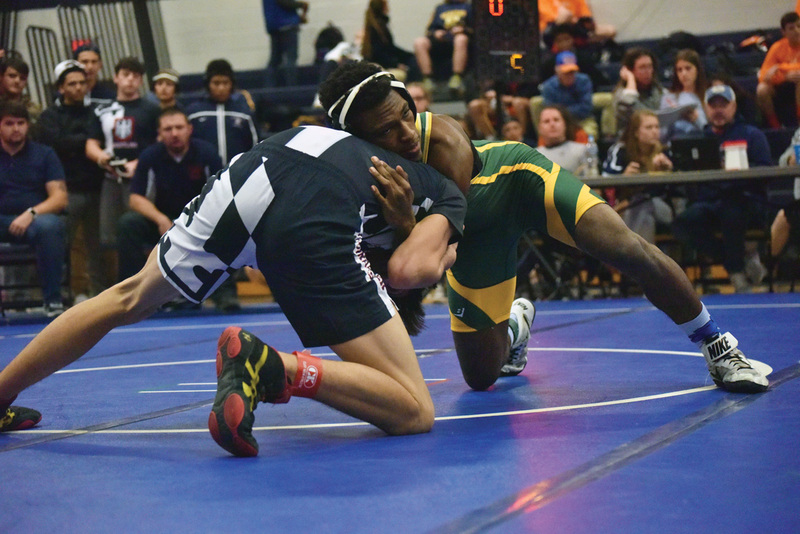 Junior Ta’Jon Knight was tops at 126 pounds, while senior Zachary Schultz captured the 195-pound class. “I was pleased overall with our performance, I really was,” said IR head coach Jeff Windish. “We had some real bright spots over the course of two days, but with that being said, there’s always room for improvement, and we need to improve on some things — especially getting ready to get into some conference dual meets in the next week or two. “But we definitely had some bright spots,” he emphasized. 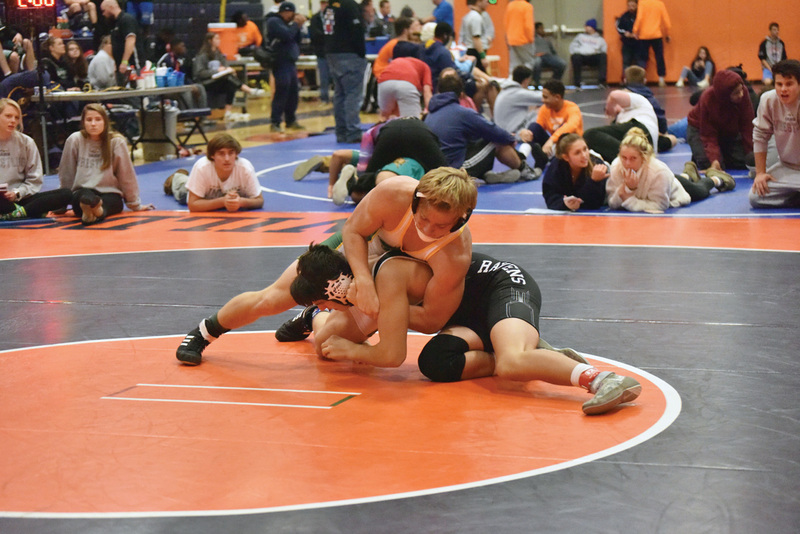 “Christopher Saylor had a good weekend at 106 pounds … had a really outstanding weekend. He had six wins, five of them pins, and that’s a good start for the season. The whole coaching staff is pleased with Chris’ performance. Saylor’s fastest pin of his performances came in Round 1 when he decked Jabari Robertson of McDonough in 31 seconds. For Schultz, it’s been a good start to his final season in the green-and-gold. He pinned Trevor Parker-Apple of Parkside (Md.) High School at the 4:12 mark in the championship final. “I went out there and had some fun, wrestled hard and won,” Schultz said after his second win. “I worked pretty hard at practice, and it paid off on the mat,” said Knight, who pinned Polytech’s Chase Masten in the finals. Senior Reshawn Turner came away with a 4-1 mark on the weekend, but came up short in the finals of the 152-pound class. He had to forfeit to Lake Forest’s Seth Fleming due to injury. Classmate Dylan Ely also picked up a second-place finish in the 132-pound weight class. Sophomore Ian Shaubach (120 pounds) brought home a third-place medal, while classmate Michael Taylor (138) dropped his fifth-place match to finish sixth overall. Jalen Holland-Holloway, also a sophomore, picked up a fifth-place finish at 145, as did junior Will Keller at 170. Senior Jake Grab (160) came away with a fourth-place finish. A pair of IR freshmen made their tournament debuts on the varsity level, with Dalton Hall taking seventh at 182 and T.J. Burke garnering a sixth-place result at 220. Rounding out the Indians’ efforts was sophomore Cristobal Alvarado-Cruz’s fifth-place performance at 285. The Indians are back in action on Friday, Dec. 14, as they head north for some Silver Eagle-hunting at Hodgson Vo-Tech.